Newark, Apr 15, 2019 (Issuewire.com) – The global food and beverages processing equipment market has witnessed moderate growth over the past few years. This can be accredited to the changing dietary patterns of consumers, rising number of quick-service restaurants (QSRs), introduction of green technologies and increasing demand for nutritious and ready-to-eat (RTE) food products. 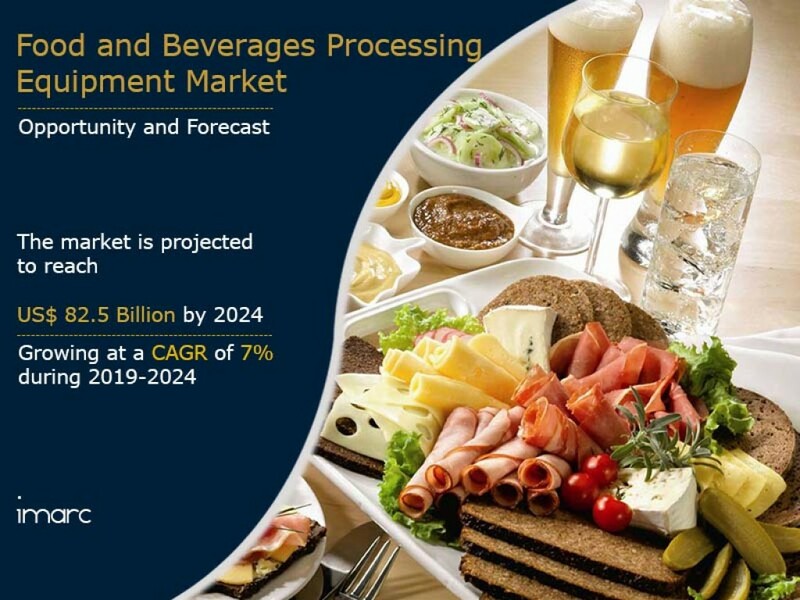 As per the latest report by IMARC Group, titled “Food and Beverages Processing Equipment Market: Global Industry Trends, Share, Size, Growth, Opportunity and Forecast 2019-2024“, the global food and beverages processing equipment market reached a value of around US$ 56 Billion in 2018. Food and beverages processing equipment are used to transform raw ingredients into consumable food products through various chemical and physical means. They comprise different measuring devices, such as timers, thermometers, weighing devices and pressure gauges, to monitor the processing, packaging and labeling of food products. They are widely utilized in the production of dairy, bakery, poultry, seafood and confectionery products. Apart from this, they are also used to automate processes such as heating, blanching, cooking and pasteurization. The emergence of green technologies has encouraged various manufacturers to replace their old equipment with energy-efficient variants which assist in reducing the carbon footprint and overall production cost. Moreover, the manufacturers are investing in research and development activities and introducing advanced technologies to expand their consumer base. For instance, they are including machine learning and Industrial Internet of Things (IIoT) along with offering flexible and customizable equipment. Further, on account of strong economic growth, rapid urbanization and improving standards of living, the demand for food products is increasing worldwide. Some of the other growth inducing factors include changing dietary patterns, growing number of quick-service restaurants (QSRs), and emerging demand for healthy, nutritious and ready-to-eat food products. By 2024, the market value is projected to exceed US$ 82 Billion, expanding at a CAGR of 7% during 2019-2024. Based on types, the market has been bifurcated into pre-processing and processing equipment. Currently, processing equipment dominates the market, holding the largest share. On the basis of end product forms, the market has been segmented into solid, liquid and semi-solid. At present, the solid form represents the largest segment, accounting for the majority of the total market share. Based on the mode of operations, semi-automatic equipment exhibits dominance in the market, followed by automatic equipment. The market has been segregated on the basis of applications which include bakery and confectionery products, meat and poultry, dairy products, fish and seafood, alcoholic beverages, non-alcoholic beverages, and others. Region-wise, the market has been classified into North America, Europe, Asia Pacific, Middle East and Africa, and Latin America. Amongst these, Asia Pacific is the biggest market, accounting for the majority of the global share. Some of the key players operating in the market include Alfa Laval, GEA Group, Bühler, Clextral, Marel, JBT Corporation, TNA Australia Solutions, Bucher Industries, Equipamientos Cárnicos, S.L. (Mainca), SPX Flow, Bigtem Makine, Fenco Food Machinery and Krones Group. Akuji Take Over! let’s travel through the UNKNOWN!